Find The Perfect Myrtle Beach Resort For You! Picking a hotel for your Myrtle Beach vacation can be tough, particularly for guests unfamiliar with the area. How do you even begin to narrow properties down? If this seems like a struggle for you, let MyrtleBeach-Resorts help! We offer three unique Myrtle Beach resort properties that all offer something unique for you and your family to enjoy. 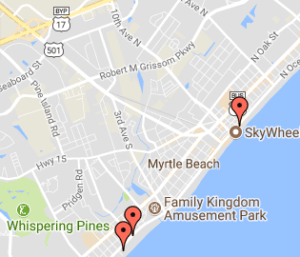 Let us help you find your Myrtle Beach resort! Our southern most property, Coral Beach Resort offers a complete resort experience for families of any size. This family favorite offers spacious rooms and suites that are all situated oceanfront or oceanview and a slew of on-site amenities. Water Park – Coral Beach is one of the only Myrtle Beach resorts with an oceanfront water park that is sure to keep guests of any age entertained! Entertainment Zone & Arcade – Recently renovated, the Coral Beach Entertainment Zone offers eight bowling lanes, several exciting arcade games, and a snack bar / ice cream shop area that combine to make this area a favorite among parents and kids alike! The Seven unique accommodation choices at Coral Beach Resort include rooms, efficiencies, and condos. Sleep space ranges from two guests up to seven guests. Located towards the south end of Myrtle Beach, Sea Crest Resort offers a well-rounded resort experience and something for guests of any age. Children’s Waterpark – The oceanfront waterpark at Sea Crest Resort is the perfect place to let the little ones run wild. Featuring a children’s water slide, silly sub, water buckets, water umbrellas, and many more water elements, the waterpark offers endless hours of fun. And, the waterpark is lined with plenty of seating so the parents can kick back and relax while the kids splash the day away. Mini-Mart & Gift Shop – Forget sun screen or room snacks? Fret not – just head down to the on-site Mini Mart & Gift Shop to stock up on all of those last minute beach needs. Sea Crest Resort offers 14 unique accommodations styles, ensuring you can find exactly what you are looking for. Lodging styles include rooms, efficiencies, and suites and can sleep up to seven guests. Located along the iconic and recently revamped Myrtle Beach Boardwalk, the Holiday Inn Oceanfront offers the ideal location for the family on the go. Tropical Paradise Beach Bar – Keep cool and stay full during the summer by grabbing a bite to eat at this Oceanfront Beach Bar. Guests can enjoy classic beach fare like fried baskets, burgers, sandwiches and wraps, and salads and grab a cool, refreshing cocktail at this popular stop. FREE Continental Breakfast Daily – Holiday Inn Oceanfront is one of the few Myrtle Beach resorts to offer a free daily breakfast to all guests! Buffet selections vary but often include pastries, fresh fruit, egg preparations, breakfast meats, pancakes or waffles, fresh coffee and juice, and more. Boardwalk Access – The Holiday Inn is connected to the bustling Myrtle Beach Boardwalk and offers direct access to area dining, shopping, events, and attractions – many of which are located just a short walk away! The Holiday Inn Oceanfront offers two distinct lodging options – the Oceanfront Tower or the Lowrise Tower. Accommodations in the Oceanfront Tower include oceanfront efficiencies and suites in the main Holiday Inn Building. Lowrise Tower accommodations include oceanfront and oceanview rooms and efficiencies and are a bit more budget-friendly than the main tower. Sleep space can accommodate up to seven guests in certain rooms. Whether you are seeking a family-friendly mecca, a great hotel on the boardwalk, or the perfect property that offers something for everyone – our Myrtle Beach Resorts are sure to meet the mark. Often times, the best beach grub can be found not by what places are advertised but by simply asking a local resident where to go. Have you ever been curious about the places Myrtle Beach residents just can’t get enough of? These Myrtle Beach restaurants might be off the beaten path but are definitely worth a trip if you want the best homemade eats. With several Grand Strand locations, you won’t have to venture far to get your hands on a juicy, hand-pressed patty from this local favorite. Known for fresh ingredients and creative concoctions, River City Café offers more than 25 signature burgers to choose from including the “Nacho Crunch Burger”, “Fried Mac and Cheese Burger”, and “Peanut Butter Burger”. If you prefer something a little tamer, try classics like the “Bacon Cheeseburger” or “Black-N-Bleu Burger” or just make your own one-of-a-kind creation. Little Pigs fits the bill when you think of a true “hole in the wall” local dive. Don’t let that keep you away, though, as this family run restaurant serves up the most succulent, fall-off-the-bone tender barbecue along the strand. Both locations (one in Socastee and another in Myrtle Beach) house smoke and roast all the meats and offer an impressive slew of hearty sides to match. The menu is simple but jam packed with a flavor punch and includes options like pulled pork or chicken, whole or half rack of ribs, and chili as entrees with sides like mac and cheese, sweet potato casserole, baked beans, slaw, green beans, and potato salad – to name a few. Located on the south end of the strand in the Seafood Capital of the state (Murrells Inlet), Wahoo’s Fish House offers fresh, local seafood – plain and simple. Selections range from local oysters, fried calamari, she crab soup, lump crab cakes, and lobster fritters to seared tuna, salmon, mahi mahi, scallops, and succulent fried seafood baskets. Enjoy tantalizing bites as you gaze over the very spot that your seafood came from as Wahoo’s sits inlet-front and offers spectacular views of the marsh. This local favorite is well worth the short drive south! Located in the heart of downtown Myrtle Beach, this local pizza joint has been a favorite for over ten years running and they show no sign of slowing down any time soon. Classis New York pizza available by the slice or by the pie can be found here in all of your favorite combinations – meat lovers, buffalo chicken, mega veggie, spinach and feta, and white – to name just a few. The thin, crispy crust, homemade sauce, and generous toppings make this pizza a true winner. Sun City Café might not be your typical Mexican restaurant but that’s what puts them a step above the rest. This locally owned and operated eatery is only open a Wednesday-Saturday for dinner during the summer (you can check their Facebook page for off-season schedules) but is well worth the effort. All ingredients are fresh and if something can be made from scratch you better believe it is – down to the handmade tortillas. Selections include tacos, quesadillas, burritos, and other classics that you’d expect. Don’t forget to grab a fresh-squeezed margarita to complete your south of the border tour. Nestled in a small space right off Highway 17 Bypass, Boom Boom Wine Room offers a cozy atmosphere and killer tapas plates, making this a perfect spot for date night or a girls’ night out on the town. All menu selections are made with fresh, local ingredients and change often to reflect what is in season. Though the menu varies, popular items include: baked lamb and pork meatballs, warm bacon n’ cheddar biscuits, braised short rib, and customizable charcuterie plates – to name a few. Boom Boom also offers a unique Cruvinet system that allows guests to find the perfect one, three, or five ounce wine sample to accompany each course. Located within the bustling Broadway at the Beach complex, King Kong sushi artfully balances offering an extensive sushi selection while maintaining an incredibly high quality product. Culinary minimalists will enjoy the diverse nigiri, sashimi, and maki selections while those who like to live on the wild side will surely find plenty to keep them busy with the specialty roll selections. Popular specialty rolls include the “South Carolina Roll”, “Lava Roll”, and the “Hurricane Roll” – to name a few.